Burley Knit Terry: This is a super absorbent, heavy-weight (20-22 oz) plush knit terry with some stretch. It is the perfect material for making soakers, doublers, inserts or baby wipes. BKT can also be used to make an entire diaper but can end up bulky if you sew too many layers inside. Stretch Knit Terry: This is a thin, soft, stretchy terry which is not as bulky as burley knit terry and can be used to make entire diapers. You usually see this lightweight terry used in the baby towels and washcloths you buy in the store. Woven Terry: This is a non-stretchy woven terry like you find in towels and washcloths. It can become stiff and hard when used in diapers but some people have used it effectively without many problems. Sherpa: Sherpa is a type of knit terry that has been napped on one side. It is a wonderful soft and plush fabric (Kissaluvs have a sherpa-like finish) that is amazing next to a baby's skin. It stays soft wash after wash. It is great for entire diapers, soakers, inserts and wipes. This is one of our favorite diaper making materials! Hemp is is durable, wonderfully absorbent and has anti-bacterial properties. It is blended with cotton to keep it supple. In diaper-making, the types of hemp used are Hemp Fleece, Hemp Terry and Hemp Jersey Knit. Hemp Fleece and Terry are usually heavier weight fabrics (around 11.5 oz) and Hemp Jersey Knit is usually lighter (around 7 oz). Combinations can be used to make entire diapers. Polyurethane Laminate, or "PUL" for short, was originally designed for the medical industry but because it is waterproof, flexible and relatively soft, it works well as a waterproof layer in diapers. The fabric is usually a polyester knit with a layer of urethane bonded to the back but woven cotton, cotton/polyester blends and other fabrics can also be laminated. In addition to diapers, PUL can be used to make wet bags, diaper pail liners, cloth menstrual pads, bibs and for other sewing projects where waterproofing is needed. For diaper-making, PUL is typically available in two different thicknesses: 1 MIL and 2 MIL. 1 MIL PUL is a little less expensive and the laminate layer is thinner. 2 MIL PUL is a little more expensive and the laminate layer is thicker. Which is better? Some diaper sewers think that 1 MIL isn't quite as waterproof and use it only for day-time diapers. Other diaper sewers think that 1 MIL PUL is just as waterproof as 2 MIL, less plastic-like and easier to sew. You be the judge! Flannel can be single or double napped (fuzzy on one or both sides) and can be used in any part of a diaper. Diaper flannel is particulary suited for diaper making because it is more durable and withstands more washing and wearing. This fabric is similar to velvet. When it is used to make diapers, it is generally a soft, cotton plush pile with a polyester back for durability. It can be used in all areas of a diaper but is best right next to baby's skin. 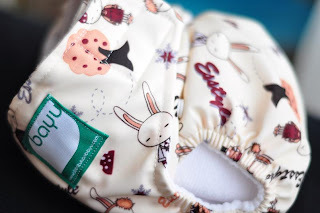 Cotton Fleece: Cotton fleece is an all-natural form of fleece that can be used in all areas of a diaper or as doublers, soakers, inserts, wipes and more. Polyester Fleece: Polyester fleece is a synthetic fleece that can be used to make water repellent out covers and stay-dry inner liners. Malden Mills PolarTec Fleece: Malden Mills makes a line of polyester fleece called Polartec. The most popular styles used for outer covers are Windpro and 300 weight fleece, though the 200 weight can be doubled up as an outer layer. These heavier weight fleeces are treated with a DWR (Durable Water Repellant) designed to keep the fleece breathable but make it water-resistant. The most popular styles used as a 'stay-dry' inner lining are Microfleece and 100 weight fleece. These fleeces are thin, soft and keep moisture away from the baby's skin and poop from sticking to the diaper. Tonitex Fleece: Tonitex makes a microfleece (an alternative to Malden Mills microfleece) that is now available in two finishes. Polar/Nordic Fleece: This is the polyester fleece that you usually find in craft stores. It usually is not very water-resistant and often pills badly. Wool is a wonderfully breathable material (available as flannel, interlock and various knits) that is often used to make diaper covers. It can absorb a lot of liquid without feeling wet. Because it is breathable and has natural antibacterial properties it doesn't need to be washed as often as other covers (up to a week!) but when it is washed, it does require special care. Wool should be always be hand-washed (unless you want tiny doll-sized covers) with detergents especially made for wool. The lanolin in wool can be stripped over time so it is necessary to re-lanolize it every so often. This is a simple process - the wool can simply be soaked in lanolin or wool wash. Sometimes babies are sensitive to wool. But, overall, wool covers are an excellent all-natural alternative to synthetic, chemically treated fabrics as an outer diaper cover. Woven cotton, which is easily available in prints, can be sewn onto the outside of PUL covers to "spice" up the diaper. It can also be bonded with a urethane layer to make it waterproof. Cotton or Cotton/Poly knits are soft, inexpensive and readily available (usually mass imported) as prints and are popular in diaper making but they are not very durable. Added polyester does increase durability a little. Some of the heavier weight knits can be used as absorbent layers. Suedecloth is a synthetic polyester cloth that can be used in the same way that polyester microfleece is used - as an inner lining that wicks moisture away from a baby's skin. It is thinner than microfleece, resists staining, does not pill and stays new-looking longer. Some people think that suedecloth doesn't work as well as microfleece. Birdseye is a tightly woven, soft cloth that is very durable. It is an old-fashioned traditional diaper making material commonly used to make flat diapers.